During the war, the city was full of mirages and I was young. But, nowadays, everything is quite peaceful. Shadows fall only as and when they are expected. Because I am so old and famous, they have told me that I must write down all my memories of the Great War, since, after all, I remember everything. So I must gather together all that confusion of experience and arrange it in order, just as it happened, beginning at the beginning. I must unravel my life as if it were so much knitting and pick out from that tangle the single, original thread of my self, the self who was a young man who happened to become a hero and then grew old. First, let me introduce myself. A blog about books, we think, would be incomplete without at least a mention of Angela Carter (1940-1992), British author of mainly magical realist fiction and new fairy tales with a strong feminist streak. Throughout her life, Carter wrote nine novels and many works of short fiction as well as non-fiction. Unfortunately, her books were largely underappreciated, in spite of her being such a prolific writer and her holding a Creative Writing teaching position at the University of Sheffield. Initially, her writings were considered not very palatable due to Carter’s heavy use of ‘mutated’ literary tropes charged with strong feminist elements. 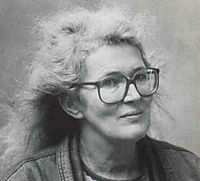 In later years, however, and especially after her death (of cancer) in 1992, her novels and short stories started to become more and more appreciated and sought for, until Angela Carter reached the level of being one of the most famous and most studied women writers in the UK. At a more global level, Carter is mostly known for her new fairy tales, modern takes on traditional stories (such as Cinderella, Snow White, The Beauty and the Beast etc. ), rendering a modern gothic atmosphere and surprising twists of the original plots. Her best-known collection of short stories is, perhaps, The Bloody Chamber and Other Stories. But Angela Carter’s storyteller skill surfaces most forcefully in her magic realist novels, where her knowledge of literature and her ability to charm the reader with her narrative voice and atmosphere meet to form a story of indisputable and unbeatable quality. Of these, we have – with great difficulty – chosen The Infernal Desire Machines of Doctor Hoffman to present. Where does one start, when it comes to writing about one of Carter’s most acclaimed books? With the intricate plot, the bewitching characters, or the form and style? Fine, let us try and begin with the plot. 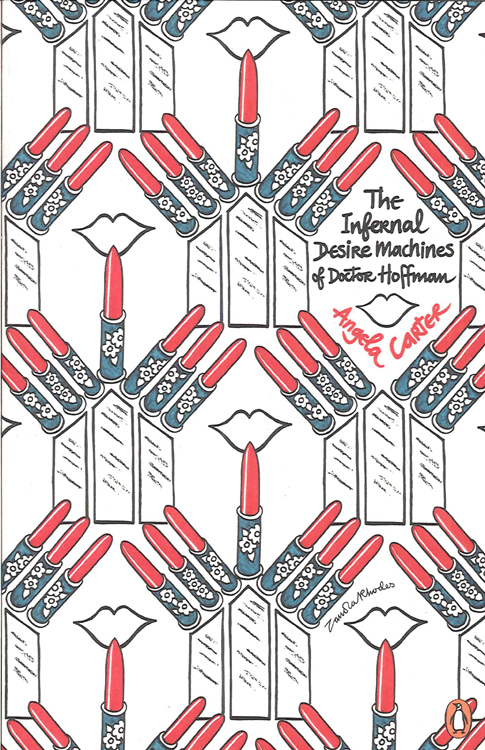 The Infernal Desire Machines of Doctor Hoffman is a picaresque novel set in an otherworldly place reminiscent in many ways of our own world. It tells the story of a young man by the name of Desiderio, caught in a strange war that suddenly erupts in the city where he lives: a war between hard-set reality and the elusive products of imagination, the hallucinatory offspring of Dr Hoffman’s generators of dreams. These ghostly apparitions greatly perturb the lives of the citizens, and whilst Desiderio is immune to their maddening properties, he soon becomes obsessed with a figure that appears nightly in his dreams: this is the form of Albertina, Dr Hoffman’s only daughter. Eventually, as the situation is growing worse and the hallucinations are gaining terrain, as a valued member of the Minister of Determination, Desiderio is sent out to find a way to eliminate the much feared and despised Dr Hoffman. Thus, the young Desiderio sets out on the journey of his life which is going to settle his own destiny and that of his besieged city. He will have mysterious and unsettling encounters with the master puppeteer of a curious peep show, an ambiguous Amerindian tribe which lives on boats and barges, a travelling funfair and many more such grotesque groups and individuals. Altogether, the plot – written from the first-person perspective of Desiderio – is very complex and has many ramifications – all of them just as challenging and exciting. In addition to this, Angela Carter sure loves intertextuality – many of her characters hint at other characters from other (classic) stories, thus creating an intricate underlayer of literary commentary. For instance, the machiavellic Dr Hoffman is reminiscent of the ambiguous figure of Herr Drosselmeyer, the toymaker from The Nutcracker and the Mouse King by E.T.A. Hoffmann (who is also a partial namesake of Carter’s antihero). The Infernal Desire Machines of Doctor Hoffman is told in an absorbing style, itself reminiscent of the narration of fairy tales or medieval tales of adventure. The story is infused throughout not only with subtle elements of feminism, but also with motifs of identity and more psychological issues of drawing the line between hidden desires and the limited potential of reality. On the whole, it is a suspenseful and challenging read, which is bound to keep the reader hooked for hours on end. Very much sociological, psychological and philosophical, as well as literary, this novel can make an exciting read, no matter which topics you are essentially interested in. Have you read Angela Carter before? How much did you know about her before now? If this blog post has sparked your interest, at least a little bit, then you know you can find The Infernal Desire Machines of Doctor Hoffman at Nautilus. Other books by the same author available from Nautilus at the moment are: The Bloody Chamber and Other Stories, Love, The Passion of New Eve, The Sadeian Woman and Several Perceptions. Also available from Nautilus, for those of you with a special interest in fairy tales, The Fairy Tales of Charles Perrault, retold and commented from a new perspective by Angela Carter.